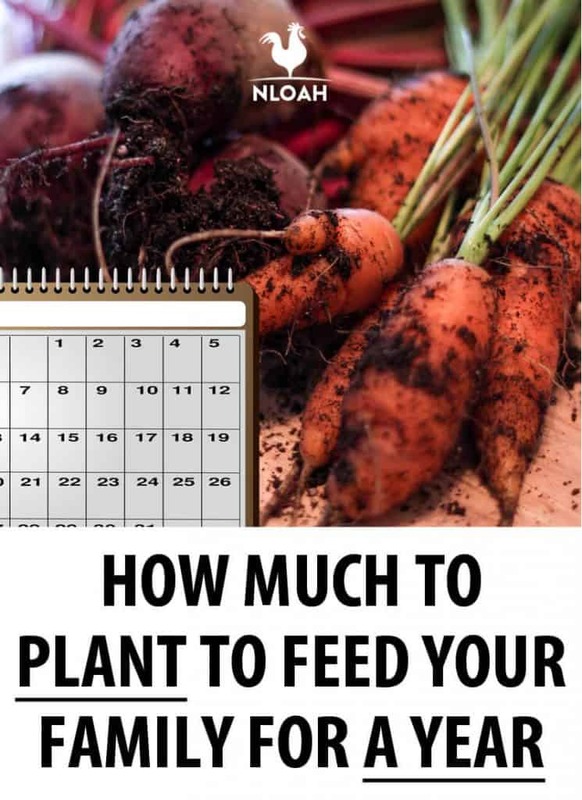 Figuring out how much you need to plant for a year’s worth of food is tricky. It’s a major question when people decide that they want to try to provide for themselves as much as possible. Homesteaders who want to grow and harvest enough food to preserve for their family for a year have quite a task in front of them, but it’s far from impossible. Until the last century or so, people had to live this way because it was the way of life. I remember my great-grandmother telling me about how her mother plotted and planned their harvest and preservation. They lived on a farm only around 20 miles from my home now. There, my ancestors raised most of the food that they ate. M grandmother told me that her mother always planned a huge garden in hopes to preserve double what she needed because you never knew when a bad harvest when come. Nowadays, we have stores, so we don’t have to rely completely on what we plant and preserve, which is a blessing. If the harvest is bad, we just head to the store to pick up what we need, but if you desire to preserve as much as possible, you need to know how much to plant. No plan is perfect for every family. It’s going to vary a bit for each person and each family. You have to first think about what your family actually eats and how many people are in your family. My family consists of six people – two adults and four kids, so my family plan is different than yours. Just because a list might include beets doesn’t mean you need to include them if your family doesn’t love them. We don’t eat beets on a regular basis, so I only plant a few. We do eat a lot of carrots, so I use that space for additional carrots. 1. What Does My Family Like to Eat? An important tip when it comes to vegetable gardening is growing the foods that you actually like to eat rather than things that you think you should plant or eat. Just because homesteaders or other gardeners are growing these lovely eggplants doesn’t mean you need to if you hate eggplants. If your family doesn’t love garlic, you might not want to plant 20 cloves per person. 2. What Does My Family Eat The Most? Think about your family’s favorite foods and what you use most commonly for your family. For example, my family eats cauliflower, but we eat broccoli at least 2 times per week. So, I plant more broccoli than I do cauliflower. Do you eat a lot of tomato dishes such as pasta and pizza? If so, then you need to plant more tomatoes. A child eats less than an adult. A toddler eats less than an older child. You need to keep the ages of each person in your family in mind as you create your plan. Most numbers are based for adults not children, so adjust accordingly. 4. Will We Eat Fresh or Do I Plan to Preserve the Surplus? Eating fresh requires fewer plants, so if you want to preserve them, make sure you increase the number of plants than what is suggested. 5. How Large is My Garden Space? Of course, one of the largest factors is the gardening space you have for your family. While the idea of growing enough of a vegetable to meet your family’s needs, it might not be possible if you don’t have the space. Each inch in your garden is valuable, so you need to use them to their maximum potential. 6. What Can I Successfully Grow in My Growing Zone? Lastly, you have to think about your climate. For those of us who live in colder climates, you won’t be able to grow some things, such as sweet potatoes. If you are able to with the help of a greenhouse or season extender, you might have a smaller crop. So, this will change how many plants per person you grow. Take a look at the recommended planting amounts for each plant. These numbers should be adjusted based on your preferences and ages of your family members because they are based on the needs of an average adult. How Much Space Do You Need to Feed a Family of 4? One of the biggest questions you might have is how much space do you need to garden to feed your family of four. In general, to grow all the food you need, expect to need between 4,000 and 6,000 square feet. This number can be lower by the use of season extenders, succession planting, and vertical gardening. These methods can help to increase the amount of harvest you can achieve in a small space. Can you imagine how many more vegetables you can grow if you have a few extra weeks of warm, growing weather? Some of us don’t live in climates that allow for long growing periods, so we have to use season extenders to get a jump start on spring gardening and to extend the growing season into the fall and winter. Basically, season extenders are anything that you can use to protect your plants from the weather extremes. Some vegetables love cooler weather, but they don’t love damp and bitter weather. Freezing ice can quickly kill your crops. Think of succession extenders like a nice jacket! Cold frames are just like a small raised bed frame that are covered by glass, creating a greenhouse-like effect. The glass cover opens and closes with hinges, so you can open it up when the weather is warm. Everyone knows about greenhouses! They can be heated and unheated, and you can find them in any sizes and materials. If you’re the handy type, you could make a DIY-greenhouse out of wood and glass, but you can also use metal hoops and plastic film. Most greenhouses are large enough to walk through. If you have kids, you can keep them in a playpen when you’re working with your plants. While greenhouses are great and offer a warm, dry environment, and they’re also expensive. A low tunnel is also called a mini-hoop house, and they’re like a small greenhouse. They only cover one or two garden beds. Gardeners love low tunnels because they’re easy to make, easy to put up and take down, plus you can reuse them elsewhere. Row covers are often called floating row covers, and they’re basically thin fabric made of some sort of spun synthetic fabric. This fabric offers protection from the cold, wind, and pests, but it’s thin enough to transmit light and rain to reach the soil. A cloche is a small cover that protects a single plant. They look like a glass bell-shape, but some gardeners use plastic milk jugs to create a simple cloche. Cloches are cheap and easy to make, but they only protect a single plant, so they’re not ideal for large gardens. Succession planting is a gardening technique to increase your yield. Your goal is to make the most of your garden space, so it works great for any garden size. You’ll alway have a fresh harvest. There are 4 different methods of succession planting. You might use one or several methods to get the most out of your crops. Companion planting is a way to interplant two or more crops together at the same time with different maturity rates. Certain plants encourage growth while other plants decrease growth. This method has you growing different vegetables in the same space over the season. Once one crop is done, you replace it with another crop. For example, you might plant some greens, harvest, amend the soil, and reseed with beans. After the beans are harvested, you plant more greens or lettuce for the fall growing season. Planting the same variety of crops with different maturity dates helps to have an uninterrupted harvest throughout the season. For example, some gardeners plant different varieties of corn have different dates to maturity. Growing enough food to feed your family of 4 takes a lot of time and effort. By using the right techniques, such as succession planting and season extenders, you can maximize how much you can grow in your home garden. Make sure to pick the right vegetables that your family eats on a regular basis, and use a variety of preservation methods. With the right planning, you can feed your family without going to the store. This article was extremely helpful. Thanks for sharing!